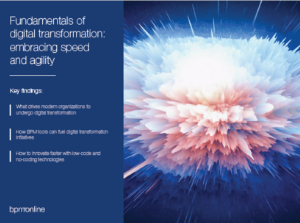 The rapidly evolving world necessitates organizations to change quickly to keep pace. Organizations that are able to manage change well flourish, whereas those that don’t risk disruption or closure. Change management varies greatly based on the nature of business and the people involved. It also depends on how well people understand the change process. 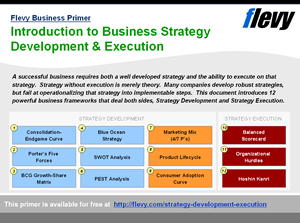 Various frameworks and models have been formulated to manage change. 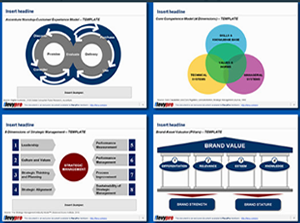 Lewin’s Change Management Model is one such framework for understanding and managing organizational change in a simple and easy-to-understand way. Presented in 1947, Kurt Lewin’s approach to Change Management is still widely used by organizations to institute change. Let’s, now take a deeper look at the 3 stages of change. The first step during the Unfreeze stage warrants undertaking the Current State Assessment (CSA) of the organization to identify what needs to change and why. The step also warrants breaking down the status quo, challenging the existing behaviors, revising the prevalent practices, and creating new ways of doing business. Next, the leadership needs to draw support for change from key people in management and across the organization through Stakeholder Analysis and Stakeholder Management, and outline it as one of the foremost priority for the enterprise. Subsequently, senior management should work on utilizing the organizational vision and strategy to substantiate the communication of the vision for transformation and the need for change across the board. This demands planning and developing persuasive messages and organized sharing mechanisms. 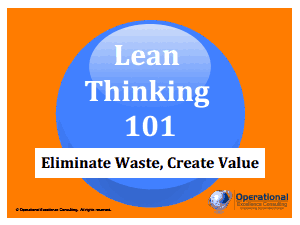 This step encompasses addressing any employee skepticism and apprehensions towards change by consistently depicting the reasons for discontinuation of existing ways of doing business to enable people embrace the need for change. Leaders may need to manage the state of equilibrium of the organizational culture by balancing counteracting forces—different factors that drive or resist change—with the help of “Force Field Analysis.” The Force Field Analysis means a thorough evaluation of the pros and cons of change. If the forces favoring change outweigh the factors resisting it, the change will happen; otherwise, the change agenda may fail. Once people are ‘unfrozen’ and ready to move towards the desired state, the transition sets in which signifies making the required changes. This time is often difficult for the people, as at this stage they are uncertain about the future, are new to the changes, and need time to grasp and adjust to them. Throughout the planning and implementation of the transition stage, leadership needs to clearly articulate and share the influence, effects, and benefits of transformation across the organization, and prepare everyone for the future. The senior leaders should support the people by holding regular sessions to candidly answer their queries, straightaway sort out any issues, and convey the need for change as an operational necessity. Next, the senior management needs to role model the desired behaviors and mindsets, plan and deliver quick wins to keep the stakeholders motivated, and empower people to come up with solutions to tackle new issues and routine matters. The next step comprises involving the people in the process, allowing them time to shift, and talking to external stakeholders (e.g., employee organizations) if required. By freezing or refreezing, Kurt Lewin means reinforcing and institutionalizing the desired changes, ensuring they are widely accepted, utilized all the time, and incorporated into the business and the organizational culture. Implementation of the freeze stage instills a new sense of stability in employees, they feel confident, form new relationships, and become comfortable with the new ways of working. 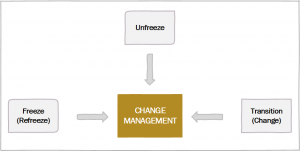 Interested in learning more about the Freeze and the first 2 stages of the Lewin Change Management Model in detail? 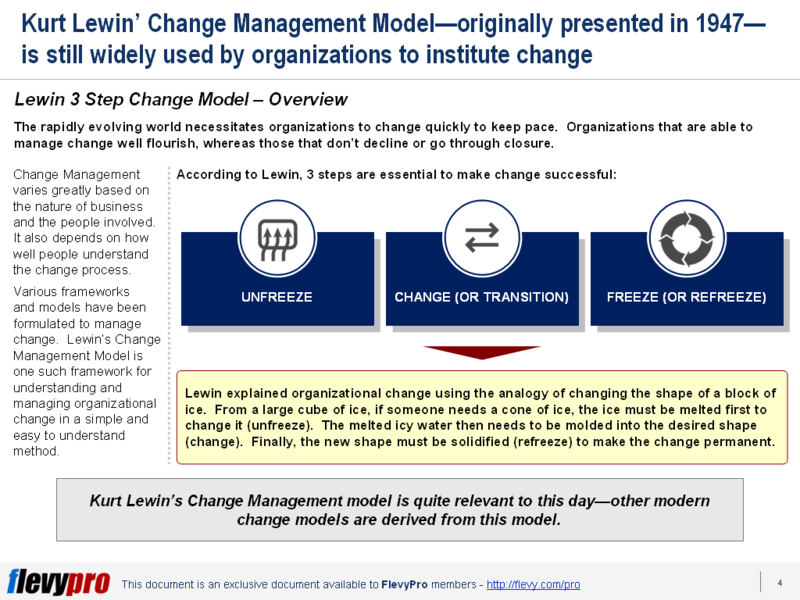 You can download an editable PowerPoint on Lewin Change Management Model here on the Flevy documents marketplace.